We have a little update concerning future plans, more specifically our Early Access/Game Preview updates. Originally we were planning to release two updates before the final release of the game: the Joy related update, and an update that would have contained the Parade District (a brand new biome). We have decided to push out only one major update between now and final release. This will be the Joy update, a bit later in the schedule (it will now come out around mid August), to make it bigger and better, and keep the Parade District for the final release. There is, of course, a reason for this decision. Early Access is amazing, but it’s becoming very complicated to maintain both a regular update schedule and lock down the story. The Early Access build is currently separate to the story build; they share a code base, but the content is slightly different. So far, the content has been able to coexist side by side, but as we add polish and really lace everything together, but this is changing. The Parade District, in particular, is intertwined so heavily with the story that we don’t think we can deliver a good “Early Access” version, unlike the other biomes. By moving to only one final major update, we can merge the Early Access and the story builds earlier, so that we can concentrate all of our efforts on making the story the best it can be. If you have any questions about this, please let us know in the comments. 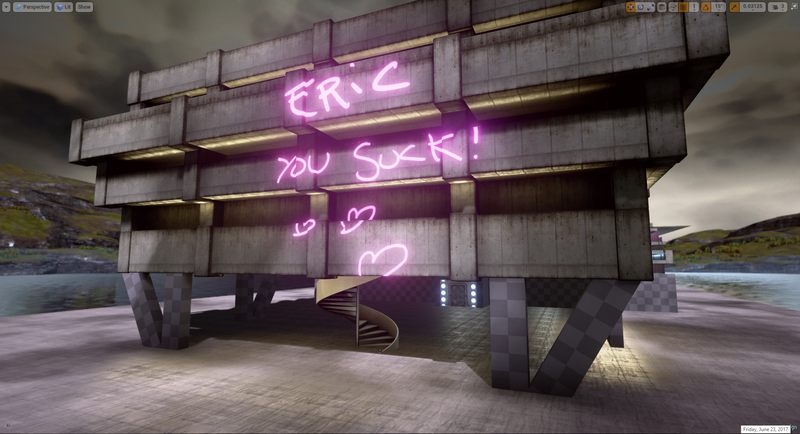 Oh yeah, working on another new huge level that Guillaume is loving. He loves it when he gets these huge levels to art up. What a guy. Such a team player. I think he really likes working with me. Anyway…….Instead of a crazy roller coaster this one is centered around a big slide puzzle in the center of a big facility. It’s been fun as hell to make. Should be pretty fun to play too, so yeah, that’s been my week. Scripting this beast. You can see your goal, just out of reach, but getting there is never as easy as it looks. Designing this sort of encounter is more about striking the perfect scale for the area of gameplay (the game-field, if you will), timing elements, such as hazards, and creating safe locations for the player. 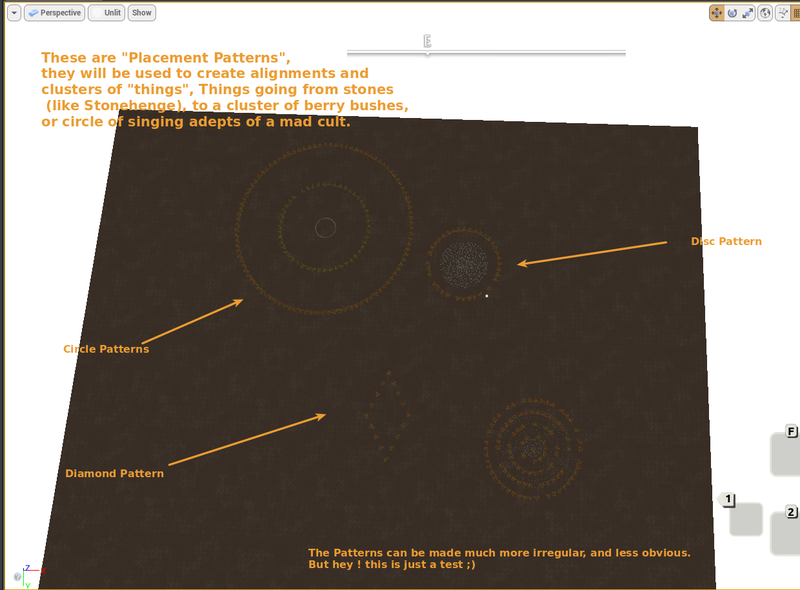 Equally as important, is planning the routes of NPCs and the placement of loot and narrative objects that fall along paths most players would navigate - so it’s a lot like choreographing a delicate ballet of rewards, hazards, and… timing. I guess, something like that. This week was focussed on getting UWP's XBoxLive connection to work, so we can verify that our Achievements code will work. This has been a bit of a battle, with Microsoft's Achievement Sample (outside of Unreal) successfully signing in, but our code failing to sign in even while using the TitleId from the sample. The good news is we had a breakthrough just this afternoon, and after setting up our own XboxLive sample based directly off of Microsoft's fork of the Unreal Engine, it appears the problem was in the Live (UWP) part of the Engine itself. So, I've grabbed the most recent version of Live for UWP, and been able to sign in to Live with the same credentials. So the next task for next week is to merge these changes back into our engine and verify that sign in works, then to switch over to the proper credentials, and turn Live services on for our game. After that, we will focus on issues from the UWP stress test, and then on to investigation/merging to start to bring in HDR rendering. Finally, Evan is jumping on to the project today. He's a programmer who'll be helping out with the UI system. Secret props for me again so I can't show, but I can say that I spent most the week sculpting, doing retopo and fighting with Maya to work with my decimated mesh and the retopo tool, but almost there! I have been off in the wilds of the Hamptons, but nothing stops progress! On Monday and Tuesday, we spent three and a half hours with the fabulous Samantha Lee, Woman of 1000 Voices. She is at least one of the voices of our Posh Wellette now, and she is at least one of the witches you’ll meet on a rocky crag. I notice I’m recording a lot more lines per hour than when we started. At the beginning, I was getting something like 60-80 an hour. Now we’re up to 120-150 an hour. What’s happening? Mostly, we’re working with better actors. Over the years, we have found truly superb voice actors, who work fast and can do multiple voices. They’ve also learned our quirks. For example, typical voice directors seem to want the actor to repeat each line a bunch of times. I want the actor to put everything into the line once, and then tell him how it should change, if it’s not what I want. I find that when an actor does two takes in a row, often neither is right. There is a sort of quantum interference. They’re not deciding what delivery they most believe, they’re just trying to create a range of deliveries. We’ve also learned a lot about working with British studios and British agents. When we started, I didn’t know how to get a casting breakdown out. In the US, you can put a casting breakdown up on Breakdown Services and get a bazillion submissions. You can do that in the UK, too, through something called Spotlight. I would imagine we’re also benefitting from the game getting a bit of attention. We get submissions from actors who might not have given us the time of day some years ago. And now, I’m writing encounter dialog. That’s always fun. It’s also surprisingly hard. It is very easy to write “oh look at that I should do this” sort of lines, but creating surprising and compelling characters and offbeat encounters requires more thinking than writing. N.B: We also wanted to share this cute story from a member of the Reddit community. "So I've played this game a lot over the last eleven-ish months. My boyfriend has watched me play it a bit and I'm sure he's picked up on a lot of the game by hearing it in the background so often. So, thanks we happy few for being a part of a huge moment in my life. this game is awesome."